We hope to have another Sojourn in the future - IF, and this is important, IF we can get enough of our members to volunteer to help. There are MANY jobs, large and small, where we could use help to make this happen. We will call for volunteers in the newsletter, and at the November general meeting - but if we don't have enough people willing to help by the time we need them, we cannot have a Sojourn. Stay tuned for specific volunteer efforts we need! Let's make this happen! If you'd like to volunteer now to help with a future Sojourn, contact any board member and we will keep you in mind! The 2013 Sojourn is behind us, and it was a success, thanks to the efforts of so many wonderful volunteers! Below are some write-ups, slide shows and photos of the 2013 Sojourn to enjoy, and whet your appetite for the next one! Plant lists are available on our checklists page. Check back here for updates on when the next sojourn will be. Sojourners enjoying a meadow of Calochortus. 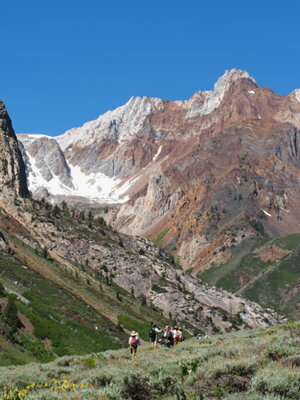 Our Bristlecone Chapter's 2013 Eastern Sierra Spring Sojourn, held May 31 through June 2, was a wonderful success due to efforts of chapter members. Many thanks to Edie Trimmer, Julie Anne Hopkins, Katie Quinlin, Sue Weis, Yvonne Wood and Kathy Duvall for hours of dedicated work beginning in January. Appreciation goes to previous coordinator Sherryl Taylor for her detailed notes and to Evelyn Mae Nicholas for her original and continued inspiration. Warm thank you's go to Steve McLaughlin who arrived on Friday with a cooler full of plants and to Steve Ingram for also bringing in many plants for the plant table. Jerry Zatorski, Paul Satterthwaite, Anne Howald, Michèle Slaton and Michael Honer assisted them in labeling. Steve Matson led an enchanting twilight hike Friday around the facility, provided flower slides on Friday and gave a fun, informative program on Saturday night. Much appreciation to Scott Hetzler for selling t-shirts and books, to Karin Coy for "happy hour," and to Laura Smith and family for catering the delicious meals. A huge thank you goes to the faithful clean-up crew: Julie Anne, Edie, Tom Brill, Paul, Michael and others, including Sojourn participants. 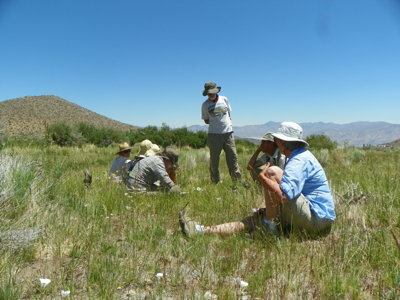 Field trip leaders went beyond all expectations and found numerous plants in a drought year at elevations from 4000 ft. on the Owens Valley floor up to 10,000 ft. at Schulman Grove in the Ancient Bristlecone Pine Forest . Thank you Mark Bagley, Scott Hetzler, Julie Anne Hopkins, Steve McLaughlin, Paul Satterthwaite, Michèle Slaton and Jerry Zatorski. Sue Weis also lead trips and organized the entire outing's events and plant lists. A final thanks to all who assisted but were not mentioned above. Please check our calendar for upcoming Sojourns. There's always more to see, as Mary DeDecker would have said, "just around the corner." More: Read trip reports and see slide shows of more trips from this wonderful event below. Resources: Plant lists are available on our checklists page. The Sojourn offered 11 field trips beginning May 31 through June 2. Below are field trip reports from three of those trips, and slide shows from three more. Future issues of the Bristlecone newsletter will add other Sojourn field trip reports. The Sojourn field trip to Oak and Division Creeks started with a stop near the South Fork of Oak Creek where the debris flow of 2008 had moved large boulders through the black oak stand, which is re-sprouting well after the fire and flood. We also found canyon live oak, probably the northernmost population on the east side. Lots of weed species came in after the disturbance, but there were still some natives blooming. There were a few Lupinus excubitus, lots of Calystegia longipes, and a few Mimulus guttatus providing color. The second stop was along the mud flow of the North Fork of Oak Creek, where we had a view of the new channel of the South Fork caused by the flood. We saw two species of Ambrosia, and one cheesebush with a new genus name. We stopped a couple more times on our way to lunch at the Baxter Pass trailhead, where Lupinus excubitus and Malacothamnus fremontii were blooming vigorously and the resprouting oaks provided a bit of shade. Phacelia, chia, a bright pink Gilia, and Camissonia were blooming on a sandy road-cut near the trailhead, and everyone was eager to get a look and maybe a photo (see photo at left). We hiked about a mile up the Baxter Pass trail among the boulders where rose penstemon, Keckiella, and apricot mallow were blooming. The two stream crossings provided some welcome shade and interesting plants like chocolate drops, Tauschia, and Lomatium rigidum. These last two have similar leaves, so it was nice to have them close together for comparison. After a short stop at the casino for some cool drinks, we drove up to the stand of narrow-leaved cottonwoods at Division Creek. This is believed to be the only verified stand in California, although the species is common in the Rocky Mountains. The twelve participants were also interested in a Ribes growing along the creek, later identified (tentatively) as R. nevadense, which is not listed in the Jepson Manual for SNE. A collection to the herbarium is in order to record a range extension. Editor's Note: The Oak/Division Creeks Plant List is available for download on our Checklists page. We began our Saturday field trip of Owens Valley habitats with a brief description of our route. The group wanted to stop by the Mary DeDecker Native Plant Garden. There we saw a number of the well-tended native species in bloom including Hecastocleis shockleyi, Dedeckera eurekensis, and Pensetmon floridus var. austinii. After Independence we went south to Lone Pine. On Lone Pine Narrow Gage Road, we stopped along the Owens River where I covered some details of the Lower Owens River Project and the group explored some of the river flood plain. In the floodplain, we had Heliotropium curassavicum and Anemopsis californica in bloom and Ericameria nauseosa var. oreophila, Atriplex torreyi, and willow species—Salix gooddingii, S. laevigata and S. exigua—in the salt grass Distichlis spicata meadow. The group continued up the east side of the valley to look at Shadscale Scrub and Greasewood Scrub. Along this route, we found an area that got some of the rare and spotty rain we had in early May. Lepidium fremontii, Stanleya pinnata var. pinnata, Psorothamnus polydenius responded with some nice floral displays along with numerous insects buzzing the flowers for pollen or other insects as prey. By lunch, the group found some rare valley floor shade under some non-native Locust, Robinia pseudoacacia, at the Manzanar Airport. At the air strip we discussed some history of the Manzanar area and vegetation conditions there today. A few lucky folks had excellent looks at LeConte’s Thrasher and Sage Sparrow, two bird species that specialize in the Chenopod scrub which surrounds the airstrip. 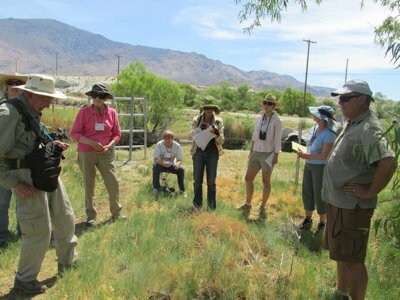 At a quick stop just east of Independence, the group saw more open alkali meadow with Screwbean Mesquite, Prosopsis pubescens (rare in the Owens Valley), growing there. A last stop in the southern portion of the valley was at the Blackrock Waterfowl Management Area, where we discussed the marsh systems maintained at this location. Numerous species of birds present gave this stop only more magic and demonstrated the benefits of mitigation efforts. The last stop was in an alkali meadow system south of Bishop, full of many sought-after valley species in full bloom such as Crepis runcinata ssp. hallii, Sidalcea covillei, Potentilla gracilis var. elmeri, and Sisyrinchium halophilum. The weather treated us well with a high of only 90 degrees and a nice southerly breeze by afternoon. Many thanks to the group of nine people who carpooled together which helped to keep some of the dust down. Editor's Note: a huge (30 page - 15 if printed double-sided) plant list for Owens Valley species is available for download on our checklists page. About this list, Jerry Zatorski said it is, "worth every peice of paper. This is the most complete species list for the Owens Valley that I have seen." McGee Creek was the place for floral displays this Sojourn. There was a full trip on Sunday and we began to see the wildflowers as we approached the trailhead in our caravan. The Astragalus whitneyi was putting on an amazing display of big clusters of beautiful pink/purple flowers, some big enough to poke out the tops of the sagebrush plants. The Astragalus purshii was blooming at the higher elevations, but already had produced its fuzzy pods near the trailhead. The mule ears and arrow-leaf balsamroot filled the canyon bottom in some places, and the salmon-colored scarlet gilia, phlox, phacelia and linanthus were there with them, adding color variety. Stick-seed, false Solomon’s seal, meadow rue, and a few iris were blooming in the riparian zone under willows, aspen, and water birch. We found four species of Castilleja on the trip, as well as an Orobanche (opinions differ on the species). The going was slow because there were so many things to find and photograph, so after lunch under a big juniper, we headed back down the trail. A great early summer trip to McGee! Editor's Note: The McGee Creek Plant List is available for download on our Checklists page. More Sojourn "Reports"- Slideshows of three more trips. What a great weekend! Friday evening trip with Steve Matson. Photos by Kristen Luetkemeier. Editor's Note: The Mazourka Canyon Plant List is available for download on our Checklists page. Sunday trip to McMurry Meadows led by Paul Satterthwaite. Photos by Kristen Luetkemeier. Editor's Note: The McMurry Meadows Plant List is available for download on our Checklists page.